In the era of digitalization not only the phones and electronic equipments are not getting smarter, but also our homes and offices becoming smart by the introduction of new technology and innovations. One of them is smart door lock mechanism or virtual keys which can be operated through your mobile phones, fingers, eyes and by the key codes set according to one's preference. Smart locks can provide real time information about the individual's access through doors and trespassers. The smart locks can be operated by mobiles through Wi-Fi or Bluetooth and by the installed mechanisms in doors like biometric sensors, keypad locks and electromagnetic sensors. The latest advancement in door locks makes you enable track, observe and restrict particular entries in your office or houses. Introduction of innovative lock systems also driving the growth of Smart Door Locks Market. For instance, ASSA ABLOY, a global leader door opening solutions has been successfully increased its R&D investment by 200% since 2006, reaching USD 280 million in 2016. ASSA ABLOY also has been ranked on Forbes list of world's 100 most innovative companies in 2016. Huge R&D investments by big market players are likely to encounter the progress of the market. In turkey, more than 1,700 smart door locks are being installed at Future Park, a new Istanbul development with apartments build on the concept of home automation. 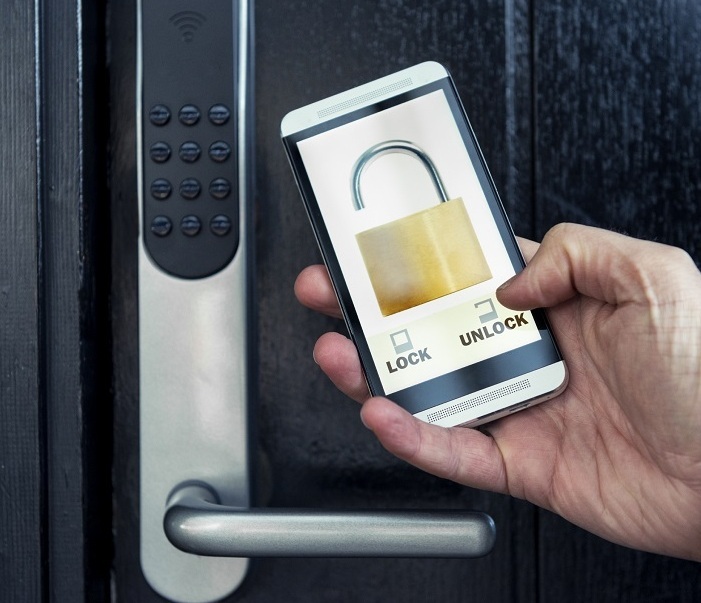 As the commercial and hotel industry plays a key role in the market of the smart doors lock, the increasing numbers of the IT companies and hotels show the potential of this market. Growing Hospitality industry in developing countries shows the utmost opportunities in smart doors market. In 2016, global hotel and real estate transaction accounted for USD 60 billion, owing to highest growth in EMEA region. The growth of digitalization and rising penetration of smart phones are tending the new generations towards the new technologies and smart devices. Which is the one of the major reason attracting the users to adopt smart door locks as smart phones play important role and becomes the virtual key. Additionally, allowing the user to track activity every time door is opening or getting alert in case of theft and tempering of the locks. Advance features of smart door locks expected to drive the growth of global smart door locks market. Geographically, developed regions are showing more attention towards smart door locks market. North America accounted for the largest market for smart door locks. In North America more than 1.5 million homes are using some type of smart door locks. North and South America together are expected to grab more than 50% of global smart door locks market during forecast period. North America is closely followed by the Europe owing to growing hospitality sector and new hotel construction in the region. Asia-Pacific region is expected to be the fastest growing market for smart door locks owing to rapid urbanization and rising personal disposable income population especially in China, India and Indonesia.